Built 1867 to replace original building. Used by Mariposa County fraternal organizations since then. 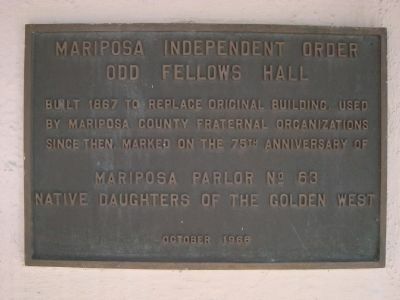 Erected 1966 by Native Daughters of the Golden West, Mariposa Parlor No. 63. Location. 37° 29.101′ N, 119° 57.91′ W. Marker is in Mariposa, California, in Mariposa County. Marker is at the intersection of 6th Street and State Highway 140 on 6th Street. Touch for map. 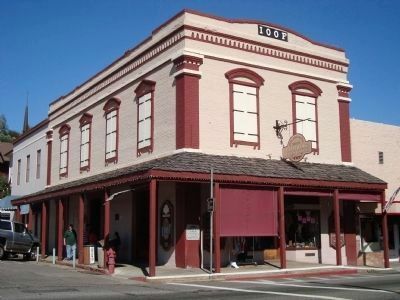 Marker is at or near this postal address: 5032 Charles (Main) Street, Mariposa CA 95338, United States of America. Touch for directions. The marker is on the wall facing 6th Street. (approx. 0.3 miles away); Mariposa County Court House (approx. 0.3 miles away); a different marker also named Mariposa County Court House (approx. 0.3 miles away). Touch for a list and map of all markers in Mariposa. More. 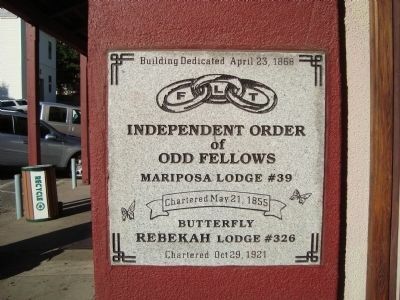 Search the internet for Mariposa Independent Order Odd Fellows Hall. Credits. This page was last revised on June 16, 2016. This page originally submitted on August 24, 2011, by Barry Swackhamer of San Jose, California. This page has been viewed 730 times since then and 6 times this year. Photos: 1, 2, 3. submitted on August 24, 2011, by Barry Swackhamer of San Jose, California. • Syd Whittle was the editor who published this page.